302 pages | 3 B/W Illus. 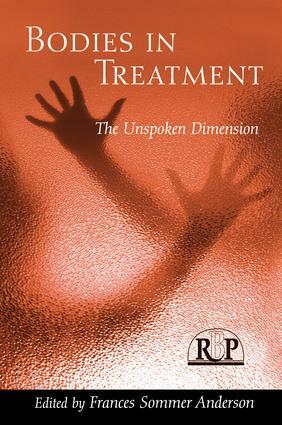 Bodies in Treatment is a challenging volume that brings into conceptual focus an "unspoken dimension" of clinical work - the body and nonverbal communication - that has long occupied the shadowy realm of tacit knowledge. By bringing visceral, sensory, and imagistic modes of emotional processing to the forefront, Editor Frances Sommer Anderson and the contributors to this original collection expand the domain of psychodynamic engagement. Working at the leading edge of psychoanalytic theory and practice, and in the forefront of the integrative psychotherapy movement, Anderson has created a collaborative project that stimulates interdisciplinary dialogue on the developmental neurobiology of attachment, the micro-processing of interchanges between the infant and caregiver, the neuroscience of emotional processing and trauma, body-focused talking treatments for trauma, and research in cognitive science. Enlightened by experiencing body-based treatments for thirty years, Anderson reflects on the powerful impact of these interventions, recounting attempts to integrate her somatically-informed discoveries into the "talking" frame. Reaching further, her contributors present richly informative accounts of how experiences in body-based modalities can be creatively integrated into a psychoanalytic framework of treatment. Readers are introduced to specialized modalities, such as craniosacral therapy and polarity therapy, as well as to the adjunctive use of yoga, the effectiveness of which can be grounded neurophysiologically. Somatic interventions are discussed in terms of the extent to which they can promote depth-psychological change outside the psychoanalytic consulting room as well as how they can enrich the relational process in psychodynamic treatment. The final sections of Bodies in Treatment explore the range of ways in which patients’ and therapists’ bodies engage, sustain, and contain the dynamics of treatment. "Is our field open enough to offer this book the reception is deserves? Are we ready to admit into our work the physical part of our experience, what Fran Sommer Anderson, the book’s editor, call a ‘visceral, sensory, imagistic’ part of our world? Are we ready to accept that we cannot know everything in verbal terms, that part of our work must be and remain an experience of the body, ‘ineluctable, numinous, often ineffable’? I hope so. We need to accept this perspective, and in the process we need to rework the longstanding overemphasis in psychoanalysis on words and linear thought. This book, along with Relational Perspectives on the Body, the first book Anderson edited (with Lew Aron), are the best places I know to begin this overdue project." "This book sizzles with new approaches to the Body in therapy. Some so challenging that the analyst may wish to say no, this is a step too far. But no's can mean, and in this instance do, that there are ideas which we are unused to which are worth engaging. The body is not just a vehicle for dissociation, projection or symbolization. It is the physical manifestation of ourselves and as such demands theory and practice that help us recognize our bodies and those of our patients. This book contributes magnificently to the project first started by Freud to understand the relation between mind and body"
"Having been intrigued by new theories that connect mind and body, and puzzled about the body treatments my patients sometimes talk about, I found this book a revelation. It discloses a startlingly wide range of body-focused thoughts and practices, extending from the use of unworded representations in talking treatment to evocative action directly on the body, with illustrations of many combined treatments between them. There is an especially useful balance of patient phenomenology and practitioner accounts. What is really an eye-opener is the variety of rationales and theoretical apparatuses that underpin these practices, referring to cognitive psychology, recent neurophysiology, the technology of Yoga and much less familiar, far more radically different ways of thinking." "[Bodies in Treatment] is a good volume that contains many chapters that deepen our understanding of psychoanalysis in the nonverbal, bodily dimension of experience. The chapters by psychoanalysts make sophisticated use of and integration of new findings in biological sciences…The book also contains a number of contributions, which were of some interest, by body therapists - practitioners of various kinds of body therapy,"
Stepansky, Preface. Anderson, Introduction. Anderson, At a Loss for Words and Feelings: A Psychoanalyst Reflects on Experiencing Bodywork. Bodily Experience in Self Organization: Contemporary Views. Cornell, Self in Action: The Bodily Basis of Self-Organization. Bucci, The Role of Bodily Experience in Emotional Organization: New Perspectives on the Multiple Code Theory. Psychoanalysts Informed by Body-Based Modalities. Eldredge & Cole, Learning from Work with Individuals with a History of Trauma: Some Thoughts on Integrating Body-Oriented Techniques and Relational Psychoanalysis. Pacifici, The Co-Construction of “Psychoanalytical Choreography” and the Dancing Self: Working with an Anorectic Patient. Gerbarg, Yoga and Neuro-Psychoanalysis. Bass, Sweet are the Uses of Adversity: Psychic Integration through Body-Centered Work. Newman, Coming into Being: Employing the Wisdom of the Body and Mind-Body Therapy. Analysts Using Bodily Experience in the Treatment Relationship. Knoblauch, Tipping Points between Body, Culture and Subjectivity: The Tension between Passion and Custom. Nebbiosi & Federici Nebbiosi, “We” Got Rhythm: Miming and the Polyphony of Identity in Psychoanalysis. The Analyst’s Body as Object and Subject. Petrucelli, When a Body Meets a Body: The Impact of the Therapist’s Body on Eating Disordered Patients. Harris & Sinsheimer, The Analyst’s Vulnerability: Preserving and Fine Tuning Analytic Bodies. Frances Sommer Anderson, Ph.D. is a Faculty member at The National Institute for the Psychotherapies Training Institute (NIPTI) and holds appointments as Clinical Assistant Professor of Psychiatry, New York University Medical School; Psychologist, Bellevue Hospital Center; and Adjunct Clinical Supervisor, Clinical Psychology Doctoral Program, City College, CUNY.